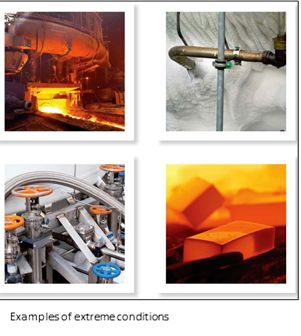 Sensors withstand extreme temperatures, pressures and aggressive chemicals. Extreme environment sensors are necessary for applications that require high accuracy, high reliability, and structural integrity in adverse conditions. When it comes to difficult environments, two primary sensor technologies are used to measure position or displacement: capacitive and inductive. Each technology has distinct advantages and disadvantages, which are described below. Capacitive sensors operate on the principal of capacitance changes between the sensor and target (object being measured) to determine distance. Capacitive sensors perform well with many different materials. They have the advantage of a relatively small spot size and are not sensitive to material thickness. They do require a target grounded to the measuring system, which is generally not a problem. They can be constructed of very high temperature materials for operation at temperatures up to 1,200°C. The main disadvantage of capacitive sensors is their sensitivity to humidity changes, fluids, or environmental contaminants. While they can be used in extreme conditions, the environment must be clean. Inductive (eddy current) sensors operate by generating eddy currents in a target material. The inductive (eddy current) sensors require a conductive target, which is a bit more limiting than capacitance technology. A ground connection between the target and measuring system is not necessary. Sensor performance is affected by target material conductivity and the sensor must be calibrated to the particular material it will measure in the application. These sensors have a larger spot size in comparison to other technologies, which makes them insensitive to material finish. Performance is also affected by temperature changes; this must be taken into account during the calibration process. One main advantage is that inductive sensors can operate in the presence of, or be totally submerged in, fluids and environmental contaminants. In general, non-conductive material between the sensor and the target is not detected. Extreme environment sensors which are capable of making both static and dynamic measurements are required for measurements in adverse conditions. 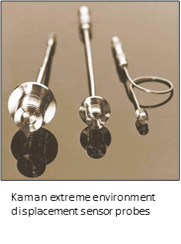 For example, Kaman manufactures a range of extreme environment inductive displacement sensors designed for continuous operation at temperatures up to 638˚C (1,000˚F) or down to -196˚C (-320˚F). The sensor probes can withstand pressures to 340 bar (5,000 psi) and are of totally inorganic construction for use in high radiation environments without degradation. The outer housing is resistant to a wide variety of chemicals. A sensor probe with a laser-welded Inconel housing and metal jacketed mineral insulated cable. A length of flexible cable between the mineral insulated cable and signal conditioner. The cable is attached to the mineral insulated cable via a transition connector. A KDM-8206 series signal conditioning electronics module. An industrial 19-inch rack or NEMA type 4 enclosure to house the electronics module. The sensor probe materials of construction were carefully selected to survive these extreme environments. The mineral insulated cable is manufactured to precise specifications and is used to transmit the probe signal to a more benign environment where the signal conditioning electronics can be located. Cable lengths (both mineral insulated and flexible) can be customized to fit each application. Calibration parameters (target material, temperatures, measuring range) can also customized. The sensor system uses thermal compensation techniques that minimize thermal shift of the output signal over the wide temperature spans. Specially designed calibration equipment is required to negate effects of thermal expansion and contraction of the calibration test set up. The result is a linear, accurate measurement of displacement over a wide range of environmental conditions. Sensor housings are rigid and not affected by pressure variations within design parameters. With the overall industry trend toward additional product performance testing and monitoring, demand for sensors to operate in extreme conditions is increasing. Extreme environment sensors are measuring position and displacement in new and increasingly difficult applications.